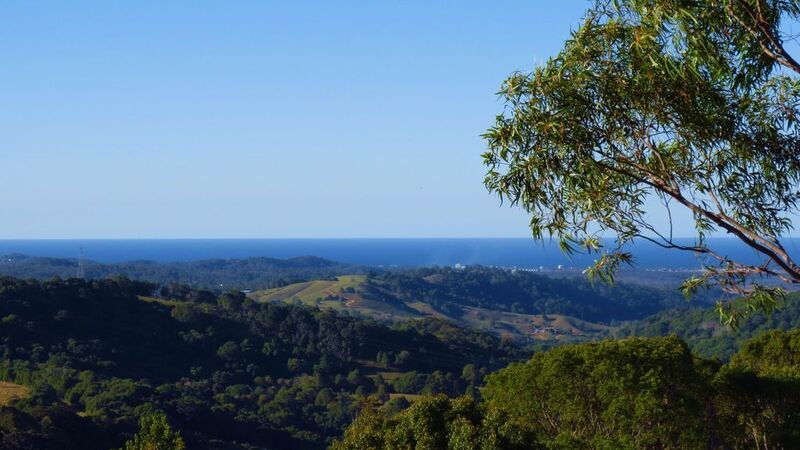 At Just Heaven you can relax and enjoy the silence, panoramic ocean, rural, and mountain views, only 20 mins drive from Gold Coast Airport, and 15-20 mins from the beautiful Gold Coast beaches of Kirra, Coolangatta, and Rainbow Bay. Wherever you look there are spectacular views of the ocean from Palm Beach to Pottsville, of the hills and valleys below, and to the west, of majestic Mount Warning. In summer, relax around the pool, or laze the hours away being gently rocked by cooling breezes in a hammock. In winter, begin the day surrounded by morning mists in the valleys below, and end it by snuggling up around the cosy fireplace. A spacious 5 bedroom, 3 bathroom + powder room, family home. Master has king bed with ensuite, 1 queen bedroom with ensuite, and 2 queen bedrooms with shared bathroom. The Bunkhouse has a king bed that separates into 2 singles if required, and 2 king singles (one with trundle). Please note: 5th bedroom (The Bunkhouse) is semi-detached from the house and does not have it's own bathroom/toilet, however, it is only a few steps from the house via a covered walkway. Cool off in the 9m eco-pool adjacent to and viewable from all living areas. Relax, de-stress, and take in the amazing views from the covered heated outdoor spa. The poolside cabana is an ideal site for an outdoor breakfast, lunch or dinner. The cabana also has a double daybed. There is a full-sized floodlit tennis court. Racquets and balls are provided. Adjacent to the tennis court is "The Park". Here, the rural views really open up and it is a perfect place for a picnic. Picnic blankets and basket are provided (food not included). Guests are welcome to access all parts of the property. From the high point of the property - "The Lookout" - the views become even more amazing. For the more adventurous, there is a natural rainforest to explore. . The accommodation is privately situated and the facilities are exclusively for guests only. Kettle, toaster, microwave, grill, oven, gas stovetop, electric frypan, rice cooker, slow cooker, sandwich press, omelet maker, espresso coffee machine. Full HD LCD TVs; DVD and CD players, ipod deck, sound system. Tea, coffee, milk, and cereal are provided. Small to medium dogs are welcome (check with manager - conditions apply). Just Heaven in the Northern NSW hinterland, is in a perfect location to access both the fun and excitement of the Gold Coast and the natural beauty of the NSW Northern Rivers area. On the property you can relax by the pool, on the daybed in the cabana, or in your own private covered outdoor spa. Eat, drink, read or just sit and take in the serenity and magnificent views from your private deck. Explore the property's 27 acres or for the more adventurous, take a trek through the natural rainforest, or up to the highest point of the property for a bird's eye view of the valleys, the ocean, and Mt Warning. Play tennis on the full-size, flood lit tennis court. Pick lemons/oranges/advocados when in season. If you don't wish to go far from the property, Carool has a local winery and cafe, and you can experience the culinary expertise of an award winning chef at Potager, which is 1 minutes drive from Just Heaven. There are also a variety of restaurants, clubs, pubs, and live entertainment within 20 mins drive of the property. Currumbin Wildlife Sanctuary is 20 minutes drive away, and beautiful Currumbin Creek offers a variety of water activities including swimming, stand-up paddle boarding, and canoeing. Sea World is a 45 minute drive away. Movie World, Dreamworld, Wet'n'Wild and the Australian Outback Spectacular are all under 1 hours drive away. Visit Byron Bay - the most easterly point of Australia - just 45 minutes south. Play golf, explore villages, attend local markets, visit the renowned Tweed Art Gallery (includes Margaret Olley's House). Go whale watching between June and October at Point Danger lookout on the border of Queensland/NSW, or from the many lookouts along the Tweed Coast, or get a close-up experience with the whales by booking a whale-watching tour. Magnificent views of ocean, mountains, and valleys. Great weekend away for a hens weekend! Denise was very accommodating of our big group for a hens weekend. The house is beautiful and has a lovely setting at the top of the hill! We had rainy weather which had a few challenges but found the house was a great retreat. Our group stayed at Just Heaven for 2 nights. We thoroughly enjoyed our stay. The house is situated on a gorgeous property with views of green rolling hills and the ocean. It's an amazing house with everything you could wish for, pool, spa and a tennis court. The pantry is stocked with quite a few items and there is a large amount of crockery and pots and pans for cooking. The house is big enough so that you can spend time away from other occupants and you can have your own space to chill. Only thing I might add is that the coffee maker doesn't have a catchment container attached to it for empty pods. I noticed once you inserted a coffee pod and finished making a coffee it had nowhere to fall to, except for on to the bench. Obviously a really minor thing, but just thought I'd mention it. Thanks Brad, Denise and Howard for your great customer service and making this such a fabulous place to stay. I would love to come back to stay here again! This was amazing, we fit all 8 people very comfortably. Stella views, gorgeous set up and incredibly relaxing. We booked Just Heaven for a family celebration of my husband's birthday over the Easter holidays. The ages of our group of 11 ranged from eight to 70, so we were a bit anxious about everyone's needs being met. We need not have worried on any count as there was so much to keep the five children occupied, (even without WiFi), leaving the adults to relax in peace. The house was so spacious that people just disappeared into their own "special place" so there was never the feeling of being overcrowded. The swimming pool and tennis court were put to good use while the three "girls" indulged in champagne and nibbles in the spa - sheer indulgence! Knowing the chaos of Easter playing out on the Gold Coast, we were all quite smug in our decision to stay "far from the madding crowd" up in our beautiful mountain top hideaway. Just Heaven was exactly that thanks to Howard and Denise. Hi Tina. Thanks for your kind words. Great to hear that all family members were catered for and had a good time. It was lovely to meet you and your family and we hope we get to see you all again one day. Hi Jenny. Thanks for choosing us. So glad you enjoyed yourselves.